Wine Victoria today welcomed the launch of the Australian Government’s $50 million Export and Regional Support Wine Package, announced by the Deputy Prime Minister the Hon. Barnaby Joyce and Assistant Minister for Agriculture and Water Resources, the Hon. Anne Ruston. 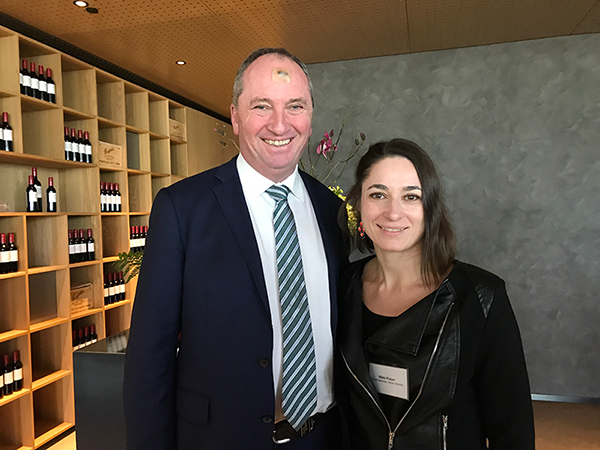 During the launch, held at Magill Estate in Adelaide, Deputy Prime Minister Joyce said the $50 million package will used to raise the profile of premium Australia wine, across both international and domestic markets, through wine tourism and export programs over a four-year period. Wine Victoria Chair, Damien Sheehan said the package would allow Victorian grapegrowers and winemakers to continue to showcase our unique terroir and premium products not only to Australians but to the world. “We have seen exponential growth Victorian sales to the Chinese wine market and the US market slowly returning,” he said. “This has been matched by a slow increase in the number of tourists visiting our cellar doors – but much more needs to be done to ensure our members can continue to kick goals in these areas,” Mr Sheehan said. “Getting our domestic and international wine tourism right also means strengthen the wider economy, already the Victorian wine industry directly contributes $7.6 billion to the state’s economy and employs about 13,000 people – most of these jobs are in regional Victoria,” he said. “However, if new wine tourism products mean an international visitor stays for one additional night and 10 per cent of Victorian’s are convinced to change their holiday plans to a Victorian destination, the Victorian economy will grow by and $2 billion every year,” he said. $500,000 to enable cider businesses to grow their understanding around potential export markets and access to these markets. “Wine Victoria and our members are now well placed to hit the ground running and competing strongly for the grant based components of the $50million support package,” Mr Sheehan said. “The opportunities before us are real and exciting, this funding is extremely timely and we intended to ensure we make the most of it,” Mr Sheehan concluded.